White sneakers are trendy, and they’re also comfortable, which makes them a must-have in our book. Here, we’re sharing what our readers recommended as the best white sneakers for travel. Help! 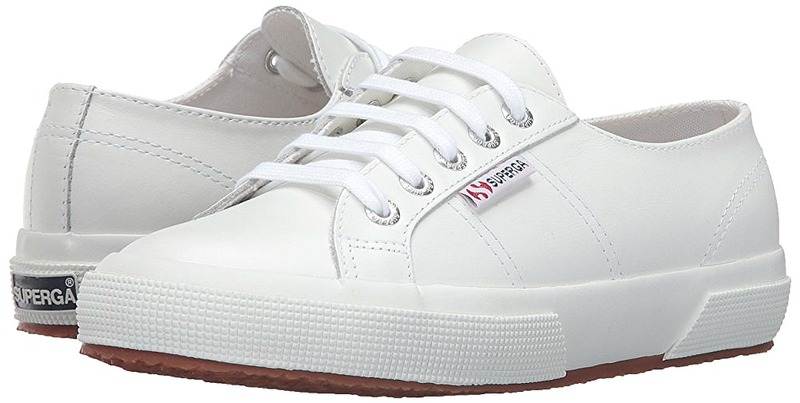 I’m trying to find some basic white sneakers I can wear with anything (dresses, jeans, etc.) that are comfortable as well, with a wide enough toe box that my feet aren’t squished. 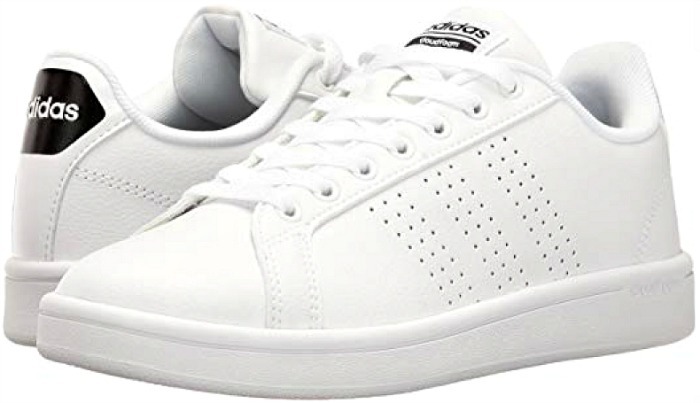 I bought some Stan Smith Boost shoes but aren’t sure if those are “the ones.” Most of the styles I’ve tried so far are either super-narrow or have no arch support whatsoever. A girl can only make (and return) so many Zappos orders. Any suggestions? Thanks so much! Finding the perfect pair of shoes to add to your travel capsule wardrobe can seem impossible at times. Sometimes they’re stylish but not comfortable. Or comfy but unattractive. We asked our readers and they shared their picks for the best white sneakers. Here’s what are our readers rated as the best white sneakers. You can read more about each item in the article below. Tip: Packing cubes make the perfect shoe bags to protect your luggage from dirty shoes. We’re big fans of Vionic shoes, and these are no exception. The slip-on style is a great alternative for when you don’t want to wear a shoe with laces. The geometric perforations make them so breathable, and add texture and dimension to a classic and sporty slip-on style. This style has a generously cushioned footbed and a grippy cupsole, so your feet stay comfortable and in place while walking. 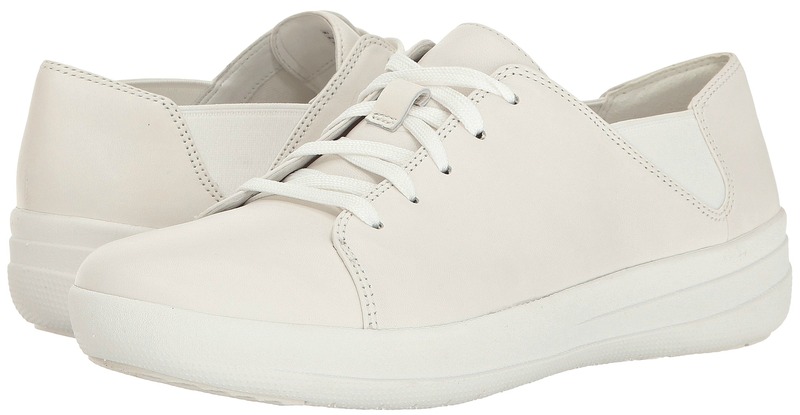 As one reader says, “Vionic has a pair of perforated white sneakers I’ve had my eye on. The most comfortable sneakers I’ve ever worn are from Vionic.” Buy it here! Rated as a top travel shoe by USA today, the Taos Star has stellar style. With a lace-up closure, rubber outsole, and soft textile lining, you can be sure of having a flexible fit with traction for various landscapes. The washed canvas leather and removable footbed makes these easy to wash and keep them clean. It’s important to note that these run small, so you’ll want to size up at least half a size. One reader shared, “Taos are awesome. They’re comfy and have great support. My feet were never tired after a day in them.” Sounds like some of the best white sneakers for travel to us! Buy it here! We’ve talked about FitFlops before, but usually we’re mentioning their amazing sandals. However, they also make a great pair of sneakers. The Sporty Lace-Up features ANATOMICUSH™ technology, which is designed with a single-density layer of anatomically curved cushioning for superior comfort. With a soft and breathable cotton lining and insulated footbed, these shoes will keep your feet dry and warm. 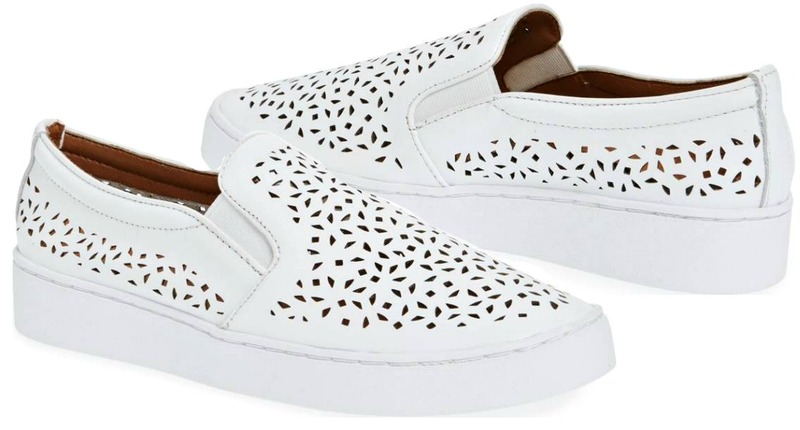 One reader says these are the best white sneakers for travel, sharing, “The most comfortable and supportive of this kind of shoe I have ever tried on or owned. Just wore the suede version for a 6 day conference (at least 11,000 steps a day) with no problem, and I am having foot surgery next week!” Buy it here! Naturalizer is known for making shoes with comfortable features and a great fit, and these Morrison sneakers are no exception. Their N5 Contour technology features dual-density cushioning on a patented contoured footbed with arch support. Along with a lightly cushioned tongue and collar, the shoes are made with lightweight and breathable materials for superior comfort and support. These shoes from Naturalizer have a cushioned footbed and come in a variety of sizes and widths for hard-to-fit feet like mine. At first, I didn’t like the tan with the white, but it’s growing on me–I think it helps prevent the shoe from looking too orthopedic.” Buy it here! 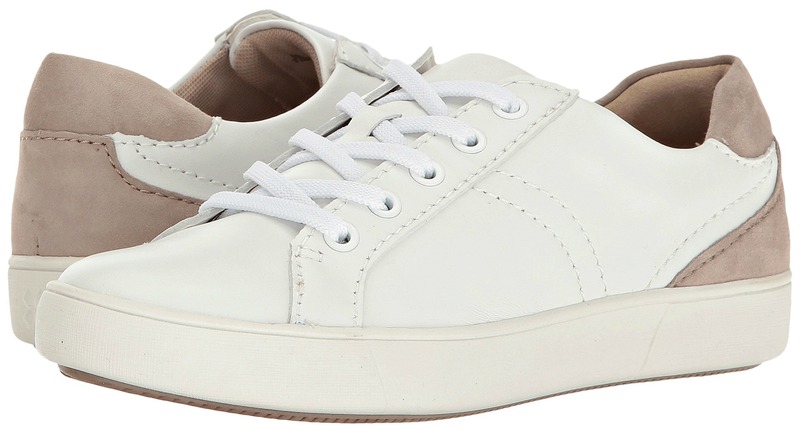 If you’re a reader of Travel Fashion Girl, you know how much we love Supergas. 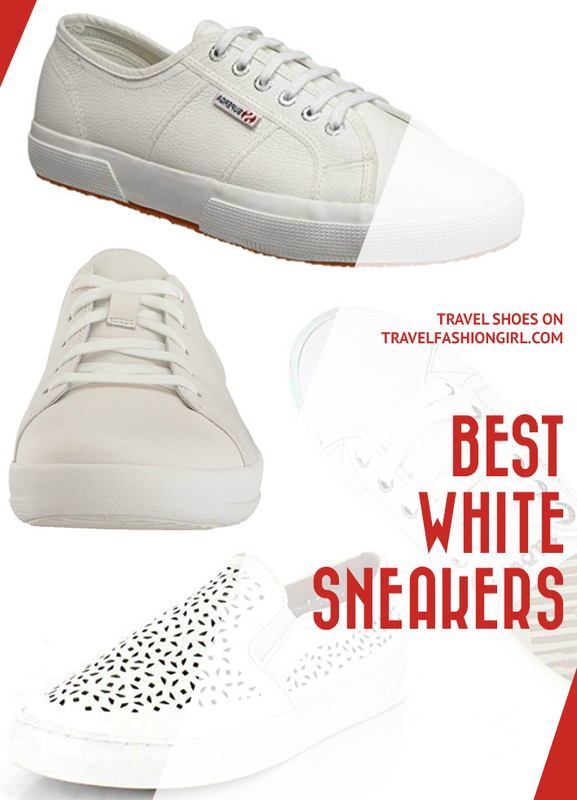 They definitely get our vote for the best white sneakers for travel but only if you do not suffer from foot issues as they offer zero support. They’re most recommended for minimal to moderate walking such as leisurely seaside or cruise vacations. One reader says, “I love my Supergas. They match everything,” and another added, “These are very comfortable.” These shoes are also great for people with wide people. One reader shared, “I have a wide toe box and the Supergas had plenty of room.” Buy it here! Read our full Superga review! It seems like Adidas Stan Smith sneakers have been everywhere! From Europe to North America and just about anywhere in between, these are the classic travel shoe of the moment. They’ve definitely made a come back over the past year and have peaked the interest in white sneakers for travel and for everyday use. You can say they’re the originator of the trend and have inspired this post on the best white sneakers for travel so we definitely couldn’t leave this trendy shoe off the list! However, if you want more comfort, the Advantage sneakers featured above boast having cushiony cloudfoam that gives an amazing step-in feel. Buy it here! Most people have owned Converse at some point and that’s because they’re a classic sneaker. They go with everything including leggings and a tunic or dress. Wear them with a skinny jean (rolled) or a jogger, and you’ll look super trendy cute but age appropriate. For traveling, add an insole for extra support. They do need to be broken in, and they aren’t ideal for women that need arch support or have back issues. For leather white sneakers, clean them with a washcloth (or baby wipes) and hair conditioner – just the cheap kind from a hotel. Dab on the cloth and wipe to condition the leather while cleaning any mud off the shoes. Buy it here! Like Supergas, SeaVees offer a great mix of style and comfort. These shoes feature a superior custom contoured, perforated footbed lined in cotton canvas. The dual compound rubber outsole provides cushioning so you can walk all day long without feeling any pain in your feet. The outsole also provides maximum grip, so you won’t slip and slide on uneven terrain, and the long-lasting wearability means you can take them around the world with you. Several readers recommended SeaVees. One reader said, “I am a fan of Seavees. Just ordered a lace up. I have the slip on ones and love them and they have a good arch support.” Another reader chimed in, “I’m a fan of my SeaVees,” with another adding, “I am sold on SeaVees. Buy it here! Don’t Forget About Gel Inserts! You can create a soft and comfortable fit in many white sneakers by adding your own padding. Whether they’re boots, heels, flats, or sneakers, add a padded insole to massively increase your comfort. Even during long promotional modeling gigs where I was required to wear high heels, I survived with specialty insoles for heels like these. For most other closed shoes, like cute black flats, I use a style like these. You can also find a large variety of insoles to meet your needs on Amazon. 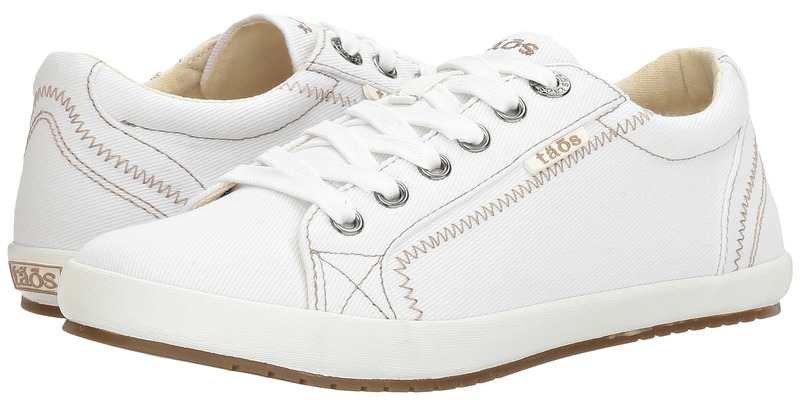 Want to pack your stylish white sneakers but worried about them becoming muddy, dusty, or dingy on your trip? Mr. Clean Magic Eraser will keep your sneakers looking brand new, no matter where you are jet-setting off to! A scrubbing sponge, Magic Erasers are super light and won’t take up space in your carry-on. Travelers love this product for keeping their sneakers looking fresh. One reader says, “I love my Magic Eraser. It keeps my sneakers looking brand new.” Sounds awesome, so there’s no need to worry about how sightseeing will ruin your sneakers! 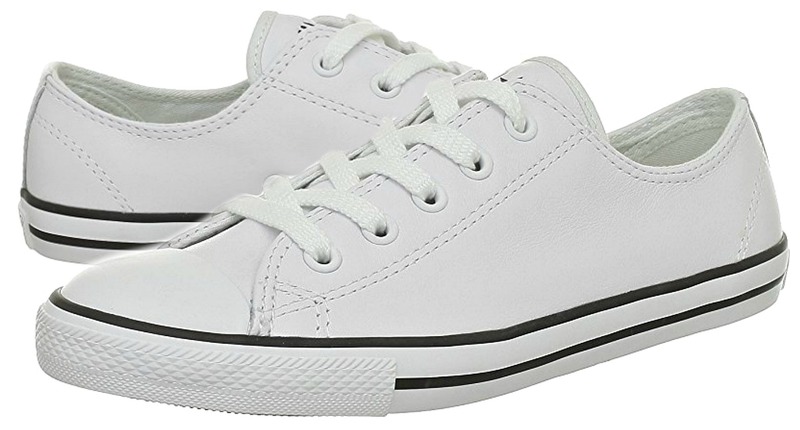 What do you think are the best white sneakers for travel? Share in the comments below! Hope you enjoyed this post on the best white sneakers for travel. Please share it with your friends on Facebook, Twitter, and Pinterest. Thanks for reading! I find the best white sneakers are Skechers. They have great arch support and memory foam and look good. I wear them everyday at home and travelling. My favourites are the ‘On-the-Go’ but they are hard to find. They seem to have been replaced with their street style but these are not as comfortable. I am going to France for 2 months in July and was thinking of only taking sneakers and flip flops (Aussies call them thongs) and wearing ankle boots but it is summer and wondering if I’ll wear the boots other than getting there and getting home. I don’t wear sandals as I don’t like my feet exposed to dirt. The thongs I mainly wear indoors. Hi, I’m one of your blog readers, and right now I’m having a little trouble in choosing what kind of shoe should i bring to my trip. I really like white sneakers, but I’m afraid if i use my white sneakers, it would get dirty. And I’m kind of person that only bring one shoe for my trip. So could you recommend me about what kind of shoe that i should bring? Shoe that could fit in any kind of outfit. Nice informative post about white sneakers, I bought a pair of OTBT Normcore white sneakers (https://www.otbtshoes.com/products/normcore-white-otbt) for myself a few months back. They are also very comfortable and don’t make me feel tired even after walking in them the whole day. Also, I am in love with their looks. Birkenstock sells a fabulous white sneaker in leather or canvas. It has an ample toe box and the cork footbed insole with good support. They go with everything! They are an investment for your feet. I highly recommend them!